For the past 18 months Yemen has been subjected to a horrific bombing campaign. Officially in charge of the campaign is the government of Saudi Arabia whose excuse is its desire to defend the interests of what it says is Yemen’s proper government, i.e., the US-approved government of Abd Rabbuh Mansur Hadi which was ousted from most of the country, including the capital Sana’a, by the long-standing Houthi led insurrection which in turn is now supported by, and supports, Saleh, the president that the insurrection had earlier overthrown. The combined forces of the Houthis and President Saleh, enjoying overwhelming popular support, were easily able to overwhelm the Hadi puppet government which Saudi Arabia is so keen to restore, but whose supporters are now confined to the south of the country around Aden, which is also rife with Al-Qaeda. Behind Saudi Arabia, however, lie the imperialist governments of the US and the UK who see the bombing of Yemen into the stone age as the best way of defending the interests of the energy multinationals with oil interests who call the US and the UK their homes. This bombing campaign, so little publicised in the imperialist media, is utterly shocking for the sheer extent of the shameless and overt commission of war crimes against the civilian population of Yemen, which even slightly embarrasses the imperialist puppet masters. Saudi targets regularly include hospitals, schools and factories catering to purely civilian needs, such as the production of bottled water and even coca cola, as well as the seemingly inevitable wedding party. In addition the countryside is being continuously peppered with cluster bombs which, besides harming innocent civilians with the deadly ordinance they spray, also plant ‘duds’ which don’t explode immediately but amount effectively to land mines that will detonate perhaps many weeks or months later when disturbed by children playing or a farmer tending his crops. “Travelling through Yemen’s northern Houthi-controlled cities and towns offers a panorama of the vicious aerial assault. Homes, schools, mosques, retail stores, restaurants, marketplaces, government offices, gas stations, power plants, telecommunications facilities, factories, bridges, roads, and UNESCO World Heritage sites have all been hit. “Some of the airstrikes display a high degree of precision. On the road north toward Saada, all four bridges – none of them spanning more than 20 yards in length – were struck directly in the centre, causing them to buckle and rendering them impassable. The lack of any visible missile craters nearby indicates they were hit with pinpoint accuracy in a single strike. Thus it is clear that in the view of the ‘coalition’, i.e., the supporters of Hadi, it is justifiable to commit war crimes in times of war, as it is ”	naïve” to imagine that a war can be won in any other way! This is course is true of any war that is waged against the interests and wishes of the overwhelming majority of the population, as is the case with the present war in Yemen. Yet, ironically, the resort to war crimes is the surest indication that the aggressors are losing. On 20 August the Saudis bombed a demonstration in support of the Yemeni government that Saudi Arabia opposes. 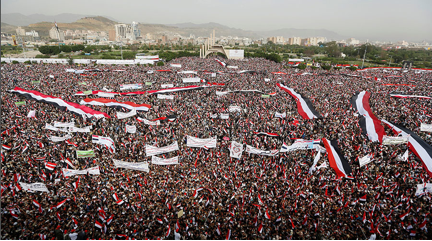 This demonstration attracted hundreds of thousands of Yemeni civilians in the Yemeni capital of Sana’a, giving lie to Saudi Arabia’s claim to be backing Yemen’s ‘real’ government. The imperialist press reported a crowd of 100,000. Pictures of the demonstration (see front page) indicate numbers far in excess of that. What is the cause of this vicious assault on a defenceless country? These days, when seeking the cause of wars conducted by or on behalf of imperialism, it is more often than not a question of ‘Cherchez l’essence’, i.e., look for the oil. What imperialism likes to call its ‘oil security interests’ lie behind most of the present devastation of the Middle East, the largest source of the world’s oil and of its distribution facilities, be they pipelines or sea routes. The imperialist energy multinationals cannot sleep soundly at night if they don’t feel that all of these are under imperialism’s firm control. Yet the more imperialism seeks to tighten that control, the more it gives rise to resistance from the people living in the areas affected. “ ‘Running out of the last of the nation’s only saleable resource, the Saudi royalty have put their country into a mess, the potential for revolution there being acute, should the people discover the real predicament. This is why we see an “all in” Saudi aggressive stance, on Syria, with Iran, and especially where Yemen is concerned. While Washington think tank evangelists try and play the tensions off as Sunni-Shiite religious friction, new oil reserves are the truth of these matters,’ Butler writes. “If Riyadh was not planning to increase its production capacity, why did it rush to install new rigs, especially offshore ones, which are 7 times more costly to run, Butler asks. The analyst believes that Saudi Arabia has been lying for decades about its actual oil capacity. “To stay on top, Riyadh has to maintain control over oil reserves beyond its borders, particularly in Yemen. The Western establishment is assisting Saudi Arabia, and with ‘reason': in November 2005 the Republic of Yemen expropriated its oil basins – the Marib Al-Jawf Block – from Hunt Oil Company and ExxonMobil affiliates. “‘And big oil hates countries taking back their resources,’ Butler remarks. “As for oil, according to the detailed 2002 United States Geological Survey (USGS), Yemen possesses vast offshore oil reservoirs in addition to its 3 billion barrels of proved oil reserves, the analyst under-scores.” (‘Riyadh’s dirty secret: Saudi Arabia thirsty for Yemeni oil, gas reserves’, Sputnik, 6 April 2016). While these arguments are, of course, merely speculative at present, they are very persuasive, especially when one considers the huge amount of expenditure that waging these wars represents. Although the cost to the victims is far greater, the cost to the Saudi aggressors, on to whom the imperialists heap the expense, is also staggering. According to Global Research (op.cit. ), “ In November, the State Department approved a $1.29 billion deal to replenish Saudi Arabia’s air force arsenal, depleted by its bombing campaign in Yemen. The sale includes thousands of air-to-ground munitions such as laser-guided bombs, bunker buster bombs and ‘general purpose’ bombs with guidance systems. “Saudi Arabia has been one of the US arms industry’s most avid customers. Between October 2010 and October 2014, the US signed off on more than $90 billion in weapons deals with the Saudi government, according to the Congressional Research Service. US arms manufacturers have also sold billions of dollars’ worth of material to the other Gulf states that are participating in the bombing of Yemen, including the United Arab Emirates and Qatar. British arms manufacturers are also coining it at the expense of Saudi Arabia (not to mention the well-being of the people of Yemen! ): according to	The Independent, ” new figures released by the Government show that British bomb and missile exports to Saudi Arabia have increased by 11,000 per cent from £9 million to £1 billion over three months last year ” (Jon Stone, ‘David Cameron accused of silently taking Britain into Saudi Arabia’s war in Yemen’, 20 January 2016). In fact, according to Diane Abbott writing in The Independent of 9 June this year, ”	UK arms companies made £2.8bn in revenues in the first year alone” out of their provisioning of Saudi Arabia for the purposes of its war of annihilation against Yemen (see ‘The Government has finally admitted we’re at war in Yemen – thanks to our relationship with Saudi Arabia’). As for the financial cost of the war to Yemen, according to a Reuters report of 6 May quoting confidential joint report by the World Bank, United Nations, Islamic Development Bank and European Union, the Saudi-backed war in Yemen, already one of the poorest countries in the world with its pre-conflict per capita GDP standing at a mere $1,097 a year, cost the country $14 billion in its first 14 months. This is the price that imperialism imposes on the oppressed countries of the world. What have the ‘socialist’ supporters of the renewal of the Trident missile system because of the need to protect the jobs of skilled British workers have to say about that? Must the jobs of our skilled British bomb makers, to say nothing of the profits of our flourishing British arms manufacturers, also be so tenderly safeguarded at the expense of the suffering of millions of people around the world? However, it should not be imagined that the military aspect of the campaign against Yemen has been left to Saudi Arabia alone. There is a great deal of military technology, for a start, that even the imperialist profiteers have kept back from countries such as Saudi Arabia, in part to protect Israel and in part because of fears that it might end up in the hands of fundamentalists prepared to use it against imperialism. For that military technology to be deployed, therefore, US military personnel must also participate in the war. As a result “The US has been a party to the conflict since the first months of the fighting. In June 2015, a US military spokesperson stated that the US was helping the coalition with ‘intelligence support and intelligence sharing, targeting assistance, advisory support, and logistical support, to include aerial refueling with up to two tanker sorties a day. '” (Human Rights Watch, ‘Saudi Coalition Airstrikes Target Civilian Factories in Yemen’, 11 July 2016). Global Research (op.cit.) adds: “As of Nov. 20, US tankers had flown 489 refueling sorties to top off the tanks of coalition warplanes 2,554 times, according to numbers provided to GlobalPost by the Defense Department”. British-made ordinance has regularly been found among the ruins of several civilian targets in Yemen, making a total mockery of Cameron’s response to Angus Robertson which was: ”	But yes – do we provide advice, help and training in order to make sure that countries actually do obey the norms of humanitarian law? Yes we do.” (cited by Jon Stone, op.cit.). Cameron, of course, was merely echoing the US imperialist excuse made in March 2016 and cited by Human Rights Watch (op.cit. ):	“The things we are doing, providing intelligence and precision guided munitions, those are things that prevent civilian casualties,” despite the fact that Human Rights Watch has found remnants of US laser-guided or satellite-guided munitions at sites involving civilian casualties. Could any further proof be needed of the malign, corrupt, dangerous and toxic nature of imperialism? How is it possible for the vast masses of humanity to tolerate the continued existence of this vile system that exists only for the benefit of the 0.1 per cent?